The Department of Budget and Management (DBM) said based on initial estimates, the Free Tuition Law will cost around P51 billion for its first year of implementation. With terrorism now becoming a global threat, the People’s Republic of China (PRC) is proposing intelligence sharing and counter-terror training with the Filipino military. THE PHILIPPINES runs the risk of courting US trade sanctions for “doing business” with North Korea and the government is concerned enough to study its next steps on this matter. CARGO throughput recorded by ports in the Philippines rose 7.42% in the first half of the year, reflecting a positive economic climate, the Philippine Ports Authority (PPA) said. THE PESO appreciated anew yesterday, reacting to a weaker dollar amid dovish comments from a Federal Reserve official on the next policy moves in the United States. Philippine tobacco output this year may not reach 50,000 metric tons (MT), as the decline in the demand for cigarettes discouraged farmers from planting the cash crop, the National Tobacco Administration (NTA) said on Wednesday. There are approximately 22,000 young Filipino immigrants who are eligible to apply for benefits under the Deferred Action for Childhood Arrivals. Only 27 percent of those eligible applied, or approximately 6,000. The rest of these young Filipino immigrants continue to wait for permanent solution to their status. With the announcement that President Donald Trump is ending the DACA program will those who took advantage of the DACA program be arrested and eventually be deported? State-run Social Security System (SSS) is looking to invest in the Duterte administration’s big-ticket infrastructure projects in line with its strategy to boost its profitability. A CATHOLIC bishop expressed fear Wednesday that more young people would be killed if the government won’t change its hardline approach to the problem of illegal drugs. 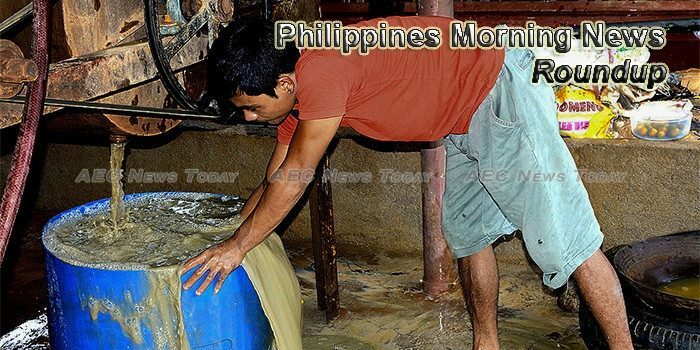 PRESIDENT Rodrigo R. Duterte’s remarks favoring a halt to open-pit mining has left miners looking for some room to maneuver, saying that his pronouncements contemplate allowing mining operations currently using the method, provided environmental safeguards are met. The Land Transportation Franchising and Regulatory Board (LTFRB) will increase the franchise validity of units operating under ride-hailing services Grab, Uber and U-Hop from 1 to 3 years, the agency told ABS-CBN News Wednesday. OUTPUT of major fruit crops, which include banana, pineapple and calamansi (Citrus microcarpa), rose in the second quarter, the Philippine Statistics Authority (PSA) said. The Chamber of Mines of the Philippines (COMP) on Wednesday said it will continue to work with the Duterte administration as it vowed to convince President Duterte on the soundness of the open-pit mining method. THIS is not a humor piece, but rather a wake-up call for Filipinos to comprehend the rising nuclear crisis that has been ignited by North Korea with its nuclear test last Sunday and its proximate emergence as a nuclear power in its own right. The National Economic and Development Authority (NEDA)-Investment Coordination Cabinet Committee (ICC-Cabcom) has approved at a higher cost and modified scope the first phase of the subway project for Metro Manila. AN estimated 10,000 Filipinos may end up getting deported as a result of Washington’s decision to cancel a program that allowed undocumented children to stay legally in the United States, the Department of Foreign Affairs (DFA) said on Wednesday. The local stock barometer fell below the 8,000 mark on Wednesday, tracking mostly sluggish regional markets as investors weighed fresh threats of military action by North Korea. As Christmas nears, the Board of Pardon and Parole has recommended to President Duterte the grant of executive clemency to 169 elderly convicts. The Chinese government has donated PHP5 million for Armed Forces of the Philippines (AFP) troops fighting against terrorists in Marawi City. Bureau of Customs (BOC) Commissioner Isidro Lapeña led the inspection of several container vans loaded with two luxury cars, automotive parts and agricultural products worth PHP19 million at the Manila International Container Port (MICP) on Wednesday. As the production of durian and pomelo increased, a decrease in its prices have been noted based on the price monitoring conducted by SunStar Davao at the fruit stands of the Magsaysay Fruit Vendors Association, Magsaysay Park in the Philippines. A SMALLER budget looms for the Department of Finance (DOF) in 2018 after the Committee on Appropriations of the House of Representatives endorsed P19.73 billion for congressional approval. A team of experts from the Philippines and the People’s Republic of China (PRC) will be conducting feasibility study on the proposed Davao City Expressway Project. The national identification system is a threat to right to privacy, safety and security, a claim made by a militant lawmaker on Tuesday as he slammed the railroading of the bill proposed at Congress. Majority of European businesses in the Philippines are optimistic of their prospects, looking to expand their operations and headcount in the country, according to the third annual EU-Asean Business Sentiment Survey. The Department of National Defense (DND) will acquire sufficient stocks of AIM-9 “Sidewinder” air-to-air missiles for the country’s 12 Fighter/Surface Attack/Lead-in Fighter Trainer (F/SA/LIFT) FA-50PH “Fighting Eagle” aircraft. The Bureau of Customs (BOC) has temporarily stopped the use of the ‘green lane’ in classifying shipments that are entering the country’s ports until a review on the system has been completed. The Philippine banana industry is strongly urging the government to return to the negotiating table with the rebels to save their sector.